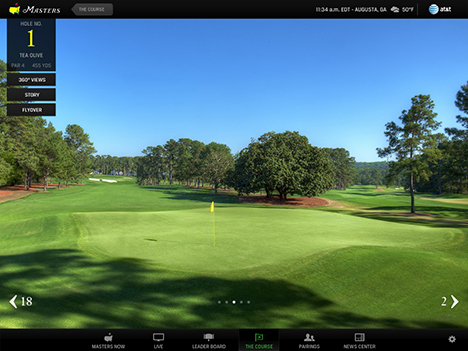 The Masters has been well ahead of the curve when it comes to producing top flight digital content for mobile devices. The killer feature of the apps is the live video. (Available only in the U.S.) Both iPhone and iPad will feature a variety of live video channels throughout the week of the tournament. The coverage begins Monday with “Masters on the Range” with special live streamed practice range show Monday thru Wednesday. You’ll also get live streaming coverage of the Par 3 contest on Wednesday. The iPad app is a thing of beauty. The main dashboard on the iPad app provides up to the minute scoring, latest video highlights, updates and news, and live video. 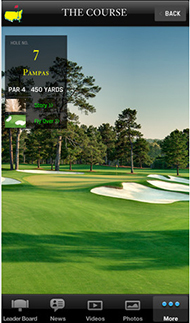 New this year is a 360 view feature that provides interactive 360 degree views from a number of locations on each hole. You’ll be able to go on a virtual exploration of Augusta National through beautiful photography, history, interactive timeline, and video flyovers of each hole. The iPhone version includes many of the same features of the iPad app with a different layout. 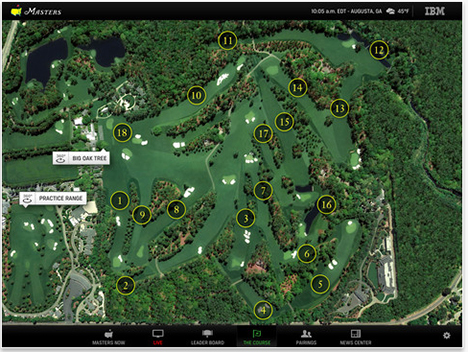 It includes the course fly-overs, pairings, live leaderboard, live video coverage, and the ability to set alerts for your favorite players. iPhone version won’t include the CBS weekend simulcast, but will still feature the exclusive hole coverage and exclusive group coverage. If you aren’t able to watch, you’ll have the option to listen to action with Masters Radio. Full tournament audio coverage beginning on Thursday around 2PM ET and running through the final round on Sunday. As it has been each year, the Masters app is real winner The iPad version is free again this season (was $1.99 a few years ago) which makes it that much better. 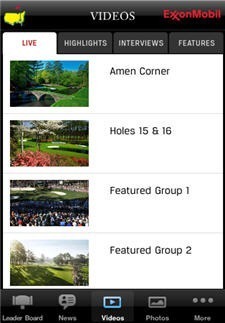 Even if you plan on watching the whole tournament on TV, the supplemental coverage, on-demand video, and other features make The Masters app a must have for any golf fan. 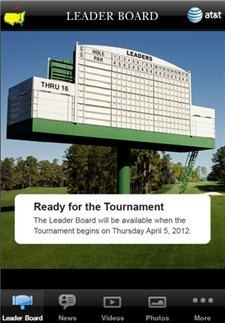 iPhone: The Masters Golf Tournament – Augusta National, Inc.
iPad: The Official Masters Tournament – Augusta National, Inc.